The Church of San Pedro el Viejo, also known as San Pedro el Grande. 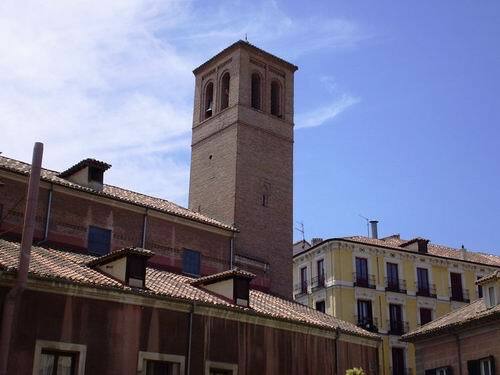 The Church of San Pedro el Viejo is at Calle Nuncio, 14 in Madrid in the southwest central part of the city. The church is also known as San Pedro el Grande, as well as San Pedro el Leal, and its address is sometimes given as Costanilla de San Pedro. While this information can be confusing, it all brings the visitor to the same place. San Pedro, whichever description it is given, is Madrid's second oldest church. It dates from the late 11th century, or early 12th century, though much of the building was renovated in the 17th and 19th centuries. The church of San Nicolás de los Servitas, lying a short distance to the northwest of San Pedro, is officially the oldest church in Madrid. San Pedro is about the same size as San Nicolás. San Pedro started out as a Benedictine monastery. It has interesting Romanesque features, especially its main door, though arguably its Romanesque cloister is even more interesting. There are Gothic feature too, as can be seen in the choir stalls. The interior plan of San Pedro has three naves. The transept has three apses. Perhaps its most important feature is its Moorish mudéjar tower. The tower of San Pedro is in even better condition that that of San Nicolás, the only other mudéjar tower on a church in the city, as it is in its original condition. The tower dates from the 14th century and it leans a little, though not nearly as much as The Leaning Tower of Pisa in Italy, but the two have been compared in a lighthearted manner. In 1886 the building was declared a National Monument. The church contains the tombs of both Kings Alfonso I, and Ramiro II. San Pedro has an impressive statue of Jesus known as Jesús el Pobre, or Jesus the Poor. The statue, by Juan Astorga, was sculpted in Seville in the late eighteenth century. In 1812 it was moved to Madrid and its current location in San Pedro. The statue of Jesus the Poor is exhibited each Holy Thursday during the Semana Santa, or Holy Week, Easter processions in Madrid. San Pedro church lies a short distance southwest of Madrid's Plaza Mayor. Getting to San Pedro church can be by bus, number 50 and 55 go there. You can also travel to this fascinating old church by Metro. La Latina is the closest, but it is several blocks away to the southeast of San Pedro church. The Opera Metro station to the north is slightly further away, but within reasonable walking distance.